ScienceInsider story and image here. Woods Hole Oceanographic Institution (WHOI) is getting its own new vessel, the RV Neil Armstrong, story here. Many of our authors at The Biological Bulletin rely on these ships for their field work, so this is excellent news. The perils of ocean acidification…. Our new virtual symposium issue of The Biological Bulletin is here. Special thanks to our three symposium editors: Ute Hentschel, Virginia M. Weis, and Margaret J. Mcfall-Ngai–superb scientists all! 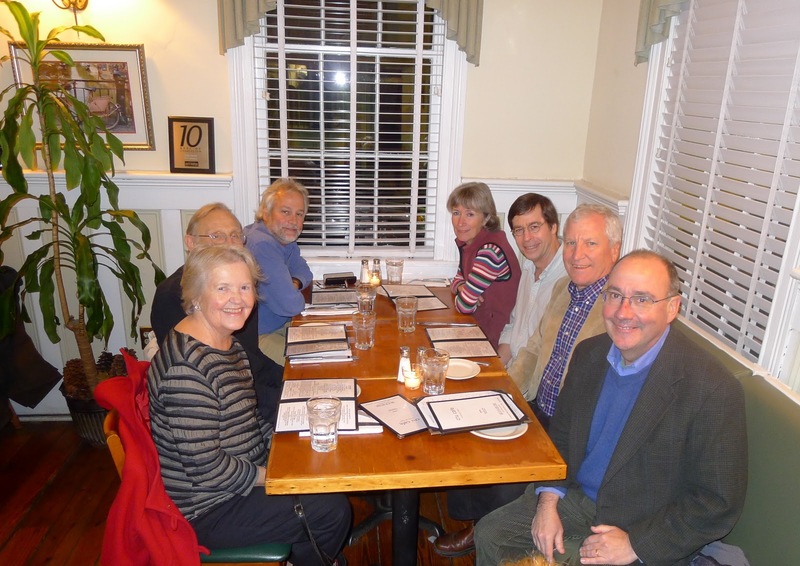 The annual Biological Bulletin Editorial Board dinner. 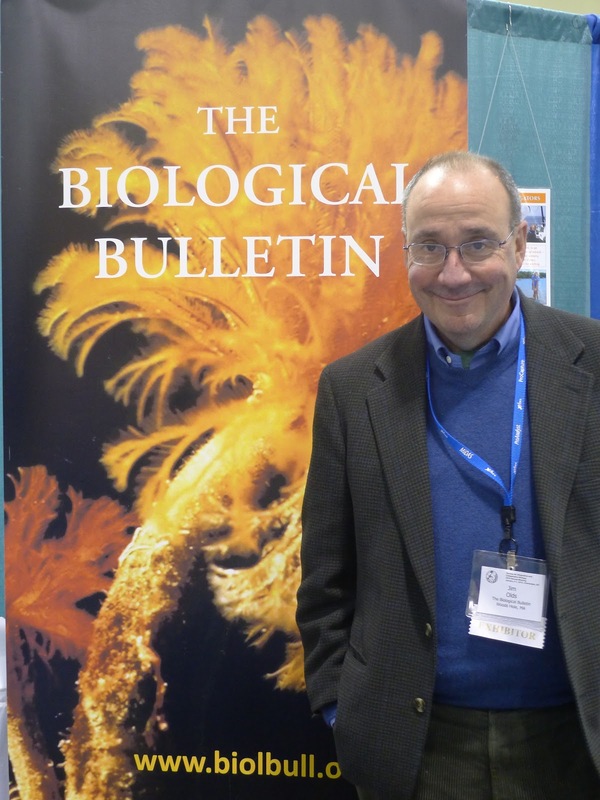 Hosted by the Journal and SICB Secretary Lou Burnett. At the terrific Cru Cafe in balmy Charleston. Around the table from the left going counterclockwise: Managing editor Carol Schachinger, editor emeritus, Michael Greenberg, Charles Derby, Karen Burnett, Bill Kier, Lou Burnett and yours truly. The editorial board meeting earlier in the afternoon was a great success. And I enjoyed viewing some excellent posters at SICB itself. But above and beyond, I learned a new skill: manning the exhibition booth! In all honesty, it was a blast. The line of graduate students to take advantage of our swag and subscription promotions was incredible. And it was a real delight to confess, as folks perused the gorgeous hard copy issues of the Journal that I was actually the editor. In the meantime, I’m back in DC and the nice weather followed me north. The leaves may be off the trees here at Krasnow, but it feels like the Spring weather is just around the corner. 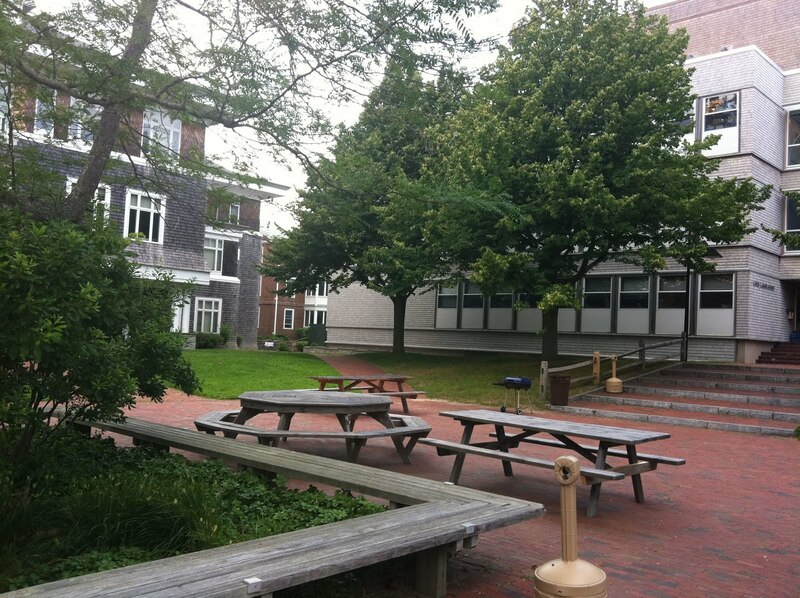 Here is the quad at the MBL yesterday afternoon. I had the good fortune to, on arrival, immediately run into many close colleagues and even one of our own Mason doctoral students along with her mother! When I’m in Woods Hole I never miss getting up very early before the tourists get here for the Martha’s Vineyard ferry, to enjoy the spectacular views and to get some quiet work in before the rest of the day gears up. The campus seems in great shape under President Gary Borisy. The annual Corporation meeting is Friday and I’m sure I’ll learn more. I’m spending time now thinking about the subject for our 2013 virtual symposium issue for The Biological Bulletin. What can possibly top regeneration (2011) and symbiosis (2012)? I suppose this counts as a bleg…. Tomorrow, I’m off for my annual visit to the Marine Biological Laboratory at the south western tip of Cape Cod on a narrow peninsula between Buzzard’s Bay and Vineyard Sound. It’s a place I’ve been visiting for more than thirty years and is the publisher of the 100+ year old journal I edit, The Biological Bulletin. Our August issue, this year will be a “virtual” symposium with articles focused on the fascinating biological phenomenon of regeneration, the process by which animals recover form and function after either injury or some normal physiological process. In the meantime, it will nice to see old colleagues and even, as has become more common, one of our current doctoral students here in Mason’s neuroscience PhD program. MBL’s summer courses are the very best in the world–they are life changing for young scientists–and in an extraordinarily positive way. When I return to Mason, next Monday, it will mark pretty much the end of summer–another two weeks and the Fall semester will begin, with all the excitement and increased activity that goes with the beginning of the academic year.